Public institutions play a critical role in promoting gender-sensitive policies and gender equality more broadly, in the MENA region and around the world. Advancing gender balance in public institutions and public life more generally, including the judiciary, parliaments, and the political executive constitutes a major step towards gender-responsive policies and non-discrimination and serves as a key milestone in promoting gender equality. 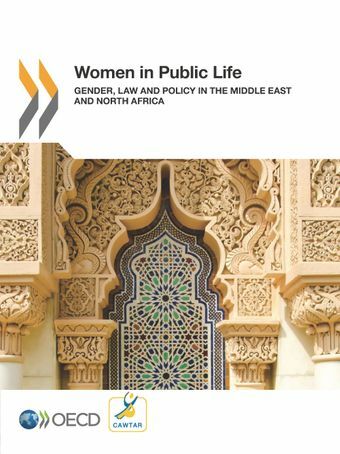 This report provides a comparative overview of the policies affecting women’s participation in public life across the MENA region. It examines the existing barriers to women’s access to public decision-making positions, and provides a cross-country assessment of current instruments and institutions to advance women’s empowerment in the MENA region. The report undertakes an analysis of the existing legal barriers for gender equality in public life, including with regard to political and economic rights, freedom of movement, labour law, family law, access to justice and gender-based violence and provides focused policy-recommendations to close legal and institutional gaps. The report has been prepared by the OECD, in partnership with Centre for Arab Women Training and Research (CAWTAR) and with the support of the Arab Administrative Development Organisation (ARADO) and covers the following countries: Algeria, Egypt, Morocco, the Palestinian Authority, Jordan, Lebanon, Tunisia, the United Arab Emirates and Yemen.